On this picture we can see something that looks like an astronaut in full suit actually repairing the Curiosity rover. It could just be part of Curiosity's own body casting a shadow over the martian landscape. 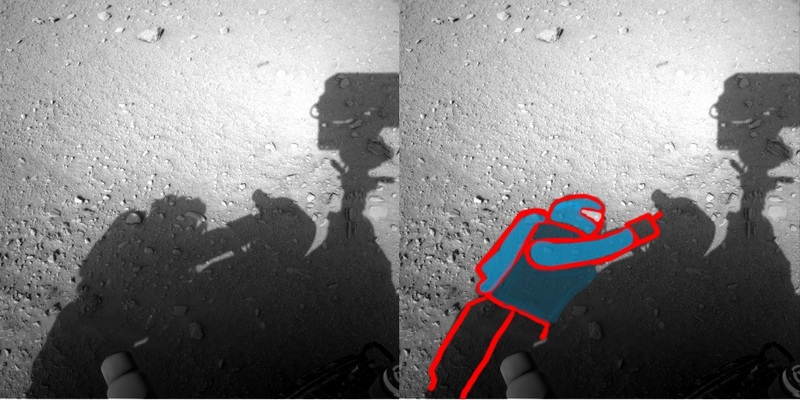 The shadow in question is clearly seen appearing at the side of the Curiosity rover in a series of pictures that have caused even the old Apollo conspiracy theorists to dust off the larger of their 12 telescopes and fire up the radio transmitter in the hopes of eavesdropping on NASA's afternoon chats with those deceitful heroes on Mars.